MX 2002 Featuring Ricky Carmichael contains a robust and addictive freestyle mode, including the Bus Jump and Step-Up challenge. 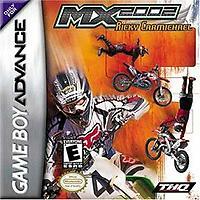 It's also the only game featuring Ricky Carmichael, four-time AMA supercross national champion. It includes 30 real riders from the 125cc, 250cc, and freestyle ranks, including Mike LaRocco, Kevin Windham, Ezra Lusk, Carey Hart, Trevor Vines, Mike Jones, and James "Bubba" Stewart. There are 22 motocross, supercross, amateur, fantasy, and freestyle tracks in the game, and such competitions as Loretta Lynn's Amateur National Motocross Championships, the Chevy Trucks U.S. Motocross Championships, the FreeRide Moto-X Championships, and the THQ U.S. Open are represented. An innovative stunt combo system enables an exhaustive list of freestyle tricks, including signature moves such as Carey Hart's Hart Attack and Tommy Clowers's Catwalk. Tight, responsive controls allow you to pull huge wheelies, stoppies, and tail whips. Six multiplayer modes include Stunt Showdown, Challenge Race, and the Step-Up Challenge. Customize with the Create-a-Rider feature (with all the name-brand sponsors) and a choice of More than 10 fully customizable bikes. The head-ringing soundtrack features real bands from the moto world's underground.